It's almost time for the off in the A to Z Challenge for 2015. I signed up last month, and entered a new blog I'm hoping to expand. And yesterday I declared my intent and announced the subjects and theme of my challenge posts. Last time I answered the challenge, I only reached the letter G. Even so, my Google rankings soared and I met many other bloggers, found some very useful blogs and learned a lot about what makes a successful post. This time I am determined to do better. There is a great camaraderie about working on a blogging challenge. There is the excitement of knowing others are looking at your posts and every day they must be the best possible. There is the inspiration of reading new, unknown blogs both in your own field and in completely unrelated subjects. For me, the challenge is also in commenting on five other blogs per day. I am apt to anguish about writing, Even writing a comment can take me far too long. Doing it day after day speeds me up dramatically. Nine days left for registration and already 1200 blogs are involved. I spent hours wading through them yesterday. Without knowing where I am on the list, I can't find the following blogs I must visit to leave comments. Panic set in until at last I found me sitting at 629. Any challenge is easier with planning. A month of daily blog posts with only Sundays off for good behavior is arduous. My theme--like the name of my new blog-- is Author Support. As I think of anything that might fit the alphabetical article headings, I set up a draft blog post with the title already there. A theme is not essential but it ties the posts together and makes it more cohesive and fun for readers. Make posts short and to the point. Bloggers have to visit five blogs a day. There will be no time to read long articles. Vary content by using clip art, photos, podcasts and videos. Make each post useful and fun. Wow Ann! Thank you so much for posting about this challenge. I have never heard of it, but I fell hook, line and clichéd sinker! I've signed up as #1334, Out of Africa (WR), and intend to use this as a push to get more inspirational articles written for my posts on International Christian Fiction Writers and my Closer Walk weekly emails. So thank you, thank you. I stupidly left the WR off when I signed up, so I have written to ask if they can edit my title. Please follow my entries and I'll signing up to follow yours as well. We can perhaps encourage one another? I'm off to see 629 right now. Annie, sorry for spelling your name wrong! I can't find you on the list. #629 belongs to a Natalie Bowers - and I can't find Author Support either. Can you check your number and let me know? Thanks. Gotcha! I'll be watching you . . . and feel free to nudge me as well! Anne, I never head of this challenge either. Sounds like a great way to broaden your visibility and reach. I have way too much on my plate for now, but maybe next year . . . Please do, Karen, it's such fun. I haven't prepared nearly as much as I should have but it is certainly doable. It does take up time, though, and you are always so busy and productive elsewhere. I didn't know about this. Maybe you could share this article with my #SharingwithWriters subscribers just before the challenge next year--maybe with a bulleted list of how you benefitted and if you have any ideas for streamling it? I'd love to, Carolyn. Thanks so much for giving me the opportunity. I always enjoy #Sharing with Writers. I'll put it in my planning diary. What a great idea, Annie. I plan to check it out in detail. Maybe see you there? Let us know your number if you do decide to go for it this year. :-} I like it because I need to be made accountable. Carolyn, this is new to me, too. I am keeping your post for future reference. Thanks for such an informative article! Oh my, it's late. Sorry, Anne. I meant to address my comment to you! 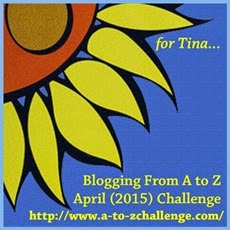 Ann, just to let you know I'm thoroughly enjoying the A to Z Challenge. Wondering if Debra made it as well? As the numbers keep changing I think it's easier to just give the blog address: I'm at shirleycorder.com/?blog. Going to check for you both now.